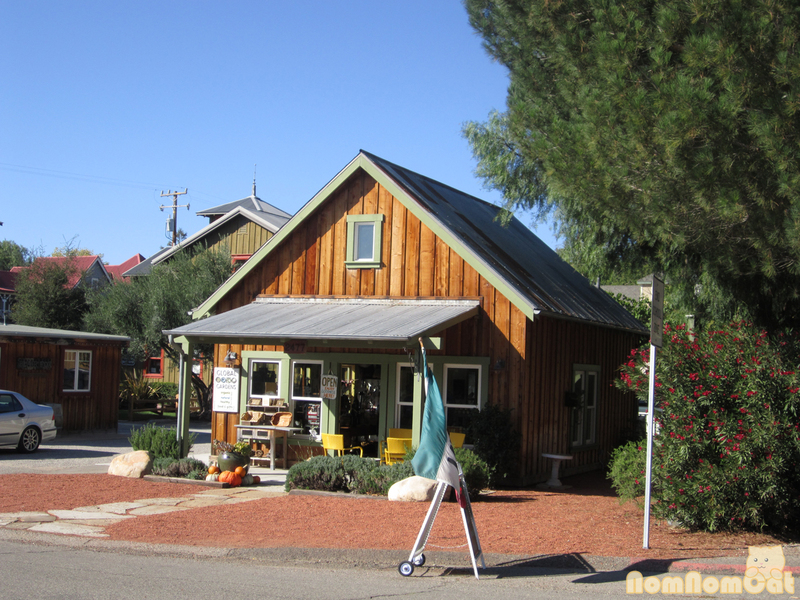 On our recent road trip along the California coastline, we stopped by Los Olivos in hopes of finding a place that offered olive oil tasting. The city’s name did not disappoint and a quick Yelp search led us to a quaint little shop just off the 154 called Global Gardens. What an adorable little store! For just $5 per person, the friendly storekeeper guides a small group of enthusiasts through a sampling of the many varieties of olive oils and vinegars they have in the store. Each of us was given a mini loaf of ciabatta and a plastic palette numbered 1-12. I’ll try to describe the different oils as best I can, but honestly I’m not much of a connoisseur and many of them tasted similar to me. The first one (the Greek Kalamata) is the standard olive oil you could find in any grocery store, but you could really taste the higher quality of the one sold here. The manzanilla blend (from the root manzana for “apple”) had a (surprise, surprise) apple aftertaste. The one that stood out the most to me was definitely the meyer lemon oil. We ended up bringing home a bottle of this. I couldn’t try the walnut oil thanks to my mild walnut allergy, but Martin said it was really nice and subtle in flavor. The tasting also included other products sold at Global Gardens including a hoisin-based Asian glaze, a Mediterranean seasoning spice blend, and Mediterranean spiced roasted almonds (sorry, the almonds were too delicious and were devoured too quickly to be captured on film). All were delicious and really captured the cuisines for which they were named. Then came my favorite part — the vinegars! The first one turned out to be our favorite of them all: a peach cinnamon balsamic vinegar. It was tart and light and fruity, plus it comes in the most adorable bottle. We discovered that it paired well with the meyer lemon oil, so we brought home a bottle of this as well. Moving along, the blood orange balsamic was extra tart, and the blueberry balsamic seemed like it would make a really great salad dressing. 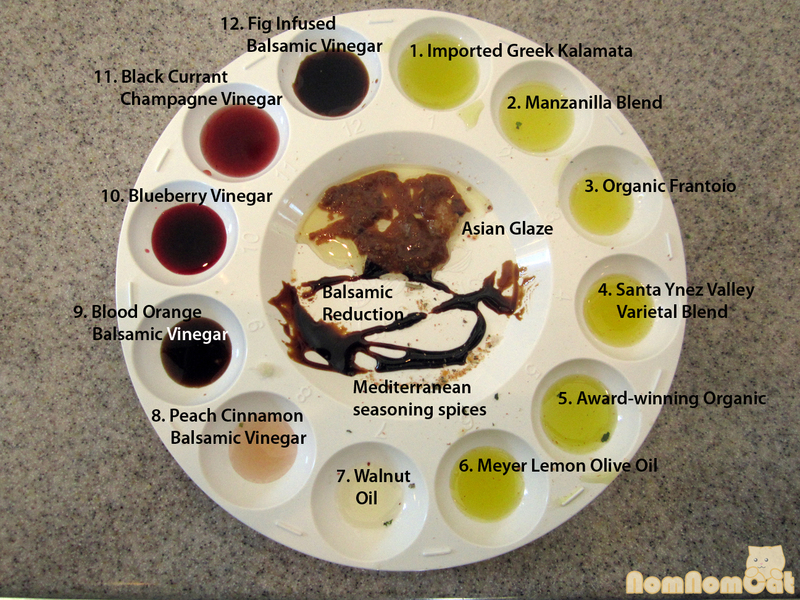 The black currant and fig vinegars were good and the fruit infusions added a great depth of flavor to the balsamic. Last was a generous drizzle of balsamic reduction, which tasted incredible! The store itself is adorable, although you’ll be able to cover all of the products on the shelves after about 10-15 minutes of browsing. In addition to the edible products, they also sell olive oil soaps, lotion, and woven baskets perfect for gifting. We enjoyed our little detour at Global Gardens and will definitely be back the next time we’re in the neighborhood. They are located just off the 154 freeway. Stop by and join the Olive Revolution!